Meet Seth Deitch: MUSC field inspector by day, creator of concert posters for the likes of Red Hot Chili Peppers, Paul McCartney, and Drake by night. His double identity was formed six years ago when Deitch reached out to Charlotte’s Bojangles Coliseum with an unconventional offer (he’ll explain later). Now, he uses his degree in graphic design, plus experience working in a Summerville screenprinting shop, to collaborate with clients ranging from major music venues to band managers and promoters in L.A., New York, Tampa, and Charleston. We caught up with Deitch to talk first gigs, past projects, and his latest exhibit at Gallery 1988 in L.A. 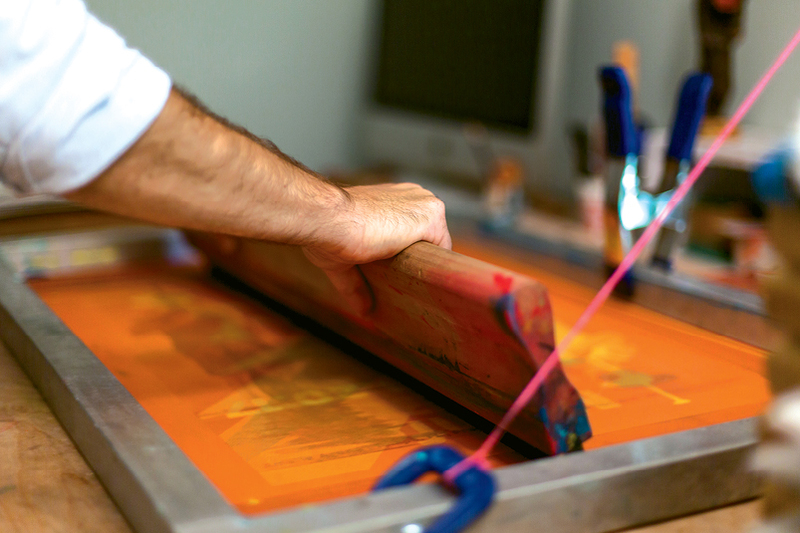 The beginning: Like many fresh college graduates, I wasn’t the richest, but I knew I could screenprint, and my wife, Ivy, really wanted to see the Avett Brothers in Charlotte. So I asked the venue if I could create a concert poster in exchange for free tickets. They put me in touch with the band manager, who didn’t take me up on the offer but agreed to sell me tickets at his discounted price. I thought that was it, but he showed my website to their promoter in Nashville, National Shows 2, and I’ve been working with them ever since. My list of clients has just grown from there. Developing a design: I research the artist’s background, what they may like or dislike, who the audience is, and the location. Rarely do I listen to their music looking for ideas. I want to create something that allows fans to take home a new connection with the artist. The printing process: First, I design the image and create positives, which are basically glorified stencils. I transfer those to the screen one at a time because every color must be printed separately. I print each poster multiple times, depending on the number of colors used. Typically, I make 50 to 100 posters per client, though I’ve done as many as 500. Deitch made the machine out of a simple printing screen, two hinges, and a counter balance. Next up: Gallery 1988 in L.A., a pop art gallery with a focus on movie- and TV-themed work, asked me to join its group of artists after I submitted some pieces. In September, I did a poster for the Netflix show BoJack Horseman and a Motorcycle Diaries one for Focus Feature Films, and this month, I did one for Blade Runner. I’ll have another piece in a Monty Python exhibit there in January. In his (few) off hours: Ivy and I have three boys—a five-year-old and 18-month-old twins. We like to go kayaking, and I love fly fishing. I’ve shown my oldest, Jude, how to screenprint—he’s good for maybe two prints, then he’s done. Click here to check out a photo gallery of Deitch's prints.